Promoter Eddie Hearn has reportedly offered WBC heavyweight champion Deontay Wilder $4 million plus U.S TV to face #1 WBC contender Dillian Whyte. Not surprisingly, Hearn has received no response from the camp of the Bronze Bomber. Hearn will now be looking to match Whyte against Kubrat Pulev instead. Hearn seems to be all over the place in trying to setup fights between his fighters and Wilder. Hearn is still in negotiations with Wilder’s managers Shelly Finkel and Al Haymon to setup a fight between him and IBF/WBA/WBO heavyweight champion Anthony Joshua. Hearn’s new $4 million offer to Wilder for a fight with Whyte suggests that he’s not serious about wanting to make the Joshua-Wilder fight. Hearn recently offered Wilder a $12.5 million flat fee to take the fight with Joshua. Hearn admits that it was a flat fee offer, and he acknowledges that if the fight does better than he expects it to, then Wilder’s percentage of the revenue will drop down to around 26 or 27 percent. Right now, Hearn says his offer to Wilder is between 30 to 35 percent for the Joshua fight, but that’s based on his low projections of what the fight will bring in. Wilder’s management believe the fight will bring in $100 million. If that number turns out to be correct, it leaves Wilder with only 12.5% of the purse, not between 30 and 35 percent that Hearn says. Wilder isn’t going to accept a fight with Whyte as long as he believes he has a chance to fight Joshua. There’s some risk involved in Wilder facing Whyte, so he’s not going to bother taking that fight. Besides, why would Wilder take a smaller money match against one of Hearn’s fighters when he has a chance to make so much more facing Joshua. If Whyte faces Pulev next, then that would be for the IBF mandatory spot. Whyte would then give up his quest to become Wilder’s WBC mandatory. It makes more sense for Whyte to fight Pulev for the IBF mandatory spot than it would be for him to face one of the top contenders in the World Boxing Council’s rankings to become Wilder’s mandatory. There’s a lot more money for Whyte in a fight against Joshua than there is in facing Wilder. 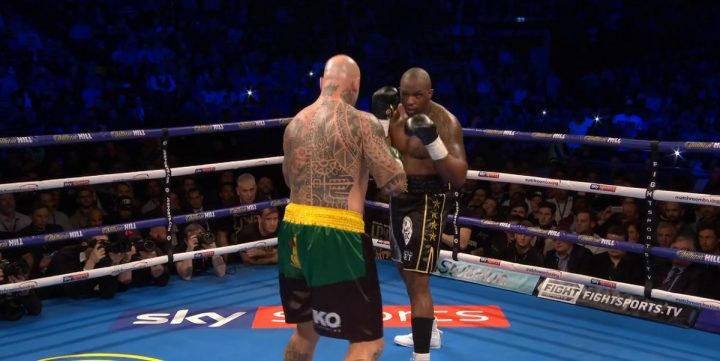 Whyte knocked out former WBA heavyweight champion Lucas ‘Big Daddy’ Browne in the 6th round last month on March 24 in London, England. Browne looked old and in bad physical shape. The fight told us very little about whether Whyte has improved as a fighter or if he simply was matched against a guy that had no business being inside the ring with him at this stage in his career.